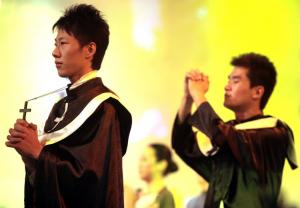 Christianity in China is on the rise. According to a 2010 NPR report, there are as many as 100 million Christians in the country. China's communist government, which is officially atheist and frowns on religious practice while tolerating it within set parameters, has cracked down on Christian gatherings that wander astray of such parameters. AFP's Robert Saiget reports that the Shouwang Church, one of Beijing's largest Christian groups, has adopted a defiant stance against what it perceives as religious persecution. After a spate of recent arrests on Christians who gather in public places, the church has vowed not to bow to the government's pressure to keep its gatherings out of the public eye. "As Easter is a very important day for us we must stick to our decision to worship outdoors," said the group's senior Pastor Jin Tianming on the phone with AFP from his home, where he is currently under house arrest. "This is our uncompromising position and a matter of faith. If they arrest our followers, this is the price we are willing to pay," he said. The government of China requires that any religious group register with the state to obtain permission to gather, and outdoor gatherings are strictly prohibited. Jin says that Shouwang, which means “to keep watch,” was established in 1993 and has repeatedly attempted to register with the government since 2006, but has been turned down each time. Government officials have exhorted Christian groups to abide by the law and recently arrested nearly 170 worshipers on April 10 when they gathered for an outdoor service Beijing's Haidan university district.